SKILLMAN, NJ. November 30, 2017 — According to a nationwide survey by Wakefield Research of 1,000 women aged 40+, the majority of women would rather not be complimented at all versus receiving one paired with the backhanded modifier “for your age.” Unfortunately, within the past year, 82 percent of women have indeed been told they look “great for their age.” In response to the findings, and in tandem with RoC® Skincare’s 60th year of advancing the science of skincare, RoC® is teaming up with actress Thandie Newton to launch the “For Your Age” campaign. By evolving the dialogue on language and aging, the goal is to eventually eliminate unnecessary qualifiers for beauty. 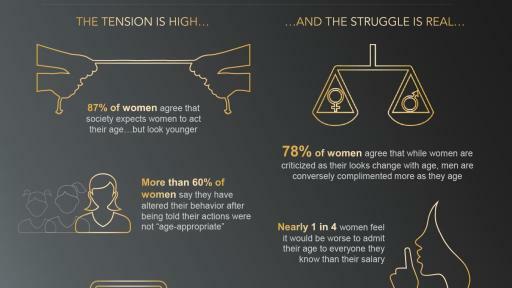 In fact, since turning 40, more than 60 percent of women surveyed say they have altered their behavior after being told their actions were not "age-appropriate." However, being "age-appropriate" is a frustrating contradiction: 87 percent believe society expects them to act their age, yet look younger. Women can join RoC® and Thandie Newton by sharing examples of compliments using #ForYourAge on social media to heighten awareness of this negative context and misguided phrasing. RoC® Skincare has been a leading French skincare brand for more than 50 years, committed to developing formulas for beauty that lasts. RoC® believes it’s the power of methods, not the promise of miracles, that help skin look and feel its best at every age. Considered a pioneer in the world of skincare, RoC® was the first to discover the method of stabilizing retinol, making it available for safe and effective daily use. And over the past 25 years, RoC® has continued to improve its aesthetics, tolerance and efficacy, partnering with a team of world-class dermatologists to develop new products that meet the needs of skin concerns everywhere. Visit RoCSkincare.com for more information on RoC® Skincare. Wakefield Research is a market research consultancy specializing in strategic and tactical research for corporations and organizations throughout the Americas, Europe, Africa, the Middle East, and Asia. This uniquely valuable background informs the marketing and positioning of some of the most prominent brands in the marketplace. Actress Thandie Newton is currently starring on HBO’s critically acclaimed series WESTWORLD. For her role as Maeve Milly, she recently won the 2016 Critics Choice Award for “Best Supporting Actress in a Drama Series,“ and was nominated for a 2017 Emmy Award, a Golden Globe Award and two SAG Awards. Thandie also starred on the small screen this year in the BBC 1 drama LINE OF DUTY where she received rave reviews for her role as, DCI Roz Huntley. On the big screen, Thandie will star in SOLO: A STAR WARS STORY, set to be released on May 25, 2018, and GRINGO, which will be released by Amazon on March 9, 2018. She also recently completed production on Xavier Dolan’s THE DEATH AND LIFE OF JOHN F. DONOVAN. Thandie is well-known for her work in the Academy Award-winning Best Picture, CRASH and has also starred in several other blockbuster films including MISSION IMPOSSIBLE 2 and 2012. Thandie also memorably spoke at the 2011 TED Global Conference on the topic of “Embracing Otherness” and in 2013 founded the online website ThandieKay, a beauty-centric site established with the goal of it being a unifying site that appeals to all women regardless of age, skin color or nationality.